The Heartland Chapter of the National Frame Building Association (HNFBA) held its annual convention and trade show, the Heartland NFBA Conference, Oct. 25-26, 2012 at the Stonebridge Resort in Branson, Mo. During HNFBA’s special award session on Oct. 26, winners in 7 categories received plaques for the annual HNFBA Building of the Year Contest. The Building of the Year Award in the Suburban Buildings category went to National Barn Company Central Division in Fort Gibson, Oklahoma. 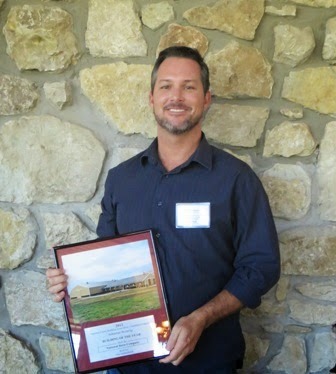 National Barn received the Award for their storage, dormitory, riding arena and horse barn project, built for Julie Schoenhofer. The building includes a 70x140x14 ft. indoor riding arena, 60x90x12 horse barn with fourteen 12x12 horse stalls, a 12x12 tack room, a 12x12’ wash bay, a 12x24’ feed room, and three 12x24’ dormitory rooms for three ranch hands to live in. Each dorm room has phone and kitchen and bathroom. The customer only wanted concrete in the tack, feed, dorms and wash bay. Post-frame saved them a lot of money by avoiding the use of concrete for the building’s foundation. The horse barn boards 14 horses and connects to the side of the arena. 5x5” posts and 3-ply laminated columns were installed 12 ft. on center. Cladding and roofing provided by Central States Mfg., windows by Atrium Vinyl, doors by Plyco and Western Products, fasteners by Sealtite and Insulation by Martin Building Products. The building was erected in 40 days at a cost per square foot of only $9.44. This hybrid post-frame design provided exceptional clear-span and height clearance, economy and quick construction. The National Frame Building Association (NFBA) represents the Post-Frame Construction Industry. The Heartland Chapter is NFBA’s newest regional affiliate, and covers the states of Kansas, Missouri, Oklahoma, Arkansas, Texas and Louisiana. For more information, visit www.heartlandnfba.org. To request photos or other information, contact Brian Keane, National Barn Co., (918) 478-3538.